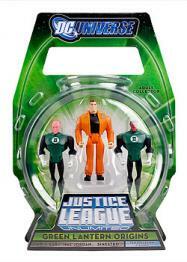 At long last Hal Jordan joins Mattel’s Justice League Unlimited collection! In this pack, you’ll not only get Hal Jordan (in his trademark Ferris Aircraft flight suit), but also his predecessor Abin Sur and his mentor/arch enemy Sinestro, both in different versions of their Green Lantern uniforms. And, for the first time in the JLU line, all of the heads in this pack are swappable, letting you play out the transformation of Hal Jordan from test pilot to Green Lantern of Space Sector 2814!